As hundreds of leaders, politicians, scientists, experts, and advocates from around the world gather in Copenhagen for the United Nations Climate Conference, the most important thing they experience might not even be on the agenda. If any of them happen to walk the streets of Copenhagen, the solution to many of their problems will be right in front of them: Bicycles. Everywhere. 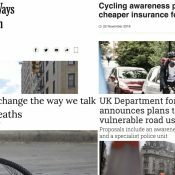 Copenhagen just happens to be the City of Cyclists and its dedication to providing streets that make biking a viable option for its citizens has already had an incalculable impact on many cities. In Portland, our local leaders and traffic engineers have made repeated visits to northern European cities (not just Copenhagen, but Amsterdam, Utrecht, Odense, and others). Each time, they’ve returned with inspiration and ideas that forever change their perspective on the power of the bicycle. Our bike boxes, buffered bike lanes, and our cycle track on SW Broadway are all direct results of Portland leaders and City engineers traveling abroad and applying what they experienced to our local streets. Putting the practices of cities like Copenhagen and Amsterdam “into an American context” (to coin a phrase from City of Portland bike coordinator Roger Geller), has made it easier for Portlanders to choose a bicycle for their daily transportation needs. 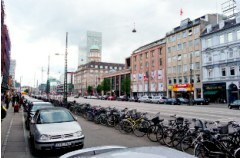 The lessons and experiences of Copenhagen are also putting pressure on the field of bike planning in America. It’s Copenhagen’s example that has provided the impetus for a broad coalition of large U.S. cities to push bike planning innovation further, faster than existing U.S. federal highway standards will allow. As the case against auto dependence grows more each day, it’s becoming even clearer that making our cities more amenable to bike traffic is a winning strategy. I just hope COP15 attendees step out of their meetings and presentations long enough to let the Copenhagenizing take hold. Well writ. Democracy Now is broadcasting from Copenhagen for the next two weeks. Here’s hoping Amy Goodman notices the cycles. Johnathan, It’s refreshing to read something that brings it back to the basics–cutting the amount of energy we all use. 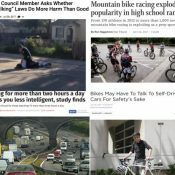 By the way, the biking culture is one of many reasons EnviroMedia expanded from Austin to Portland last year. But let’s see if they post a pic of them biking at COP15. Unfortunately for them, there are far more uniformed Americans contributing to climate change than informed Danes able to do something about it. I ride because I enjoy it, even today when it was about 18 degrees during my morning commute. As for monetary savings, what I save in parking (about $200/month for parking downtown) absolutely dwarfs the savings in fuel. oops — in #4, that would be “uninformed” Americans. Nothing against those serving in uniform. For a variety of reasons, Denmark has made a commitment to sustainability,long before it was a buzzword.It is no accident that Denmarks economy, even with a high tax rate, is more stable than ours. A former Prime Minister spoke at a conference the City hosted last spring, and he spoke at length about attitude and expectation, comparing Portland and the USA,to Copenhagen and Denmark. To achieve the results Denmark has seen will take a level of commitment, and indeed, a huge attitude shift in our daily lives. Not only personal level choices,but a fundimental shift in our economic system and and how business and profitability relates to this huge shift. I hold little hope until,like Thorton Wilder notes, we are forced to act, and will probably not choose the option that will allow us to soar,but a begrudging course that will only allow us to get by “by the skin of our teeth”. A subset of our citizenry recognize that climate change is a reality, and that a huge re-thinking is due. In this Country, the majority is like the ostrich hiding his head in the sand. I believe that individual choice, the weighing of cost and benefit, what works best for me, will drive the change from fossil to human powered transport. I don’t expect much from this conference, or the next dozen to follow. We are being forced to swallow some bad tasting medicine, and while some of us know its whats best for us, the majority are resisting. Until the ocean starts lapping on their shores.. It was fun to snag HuffPost Hopenhagen Ambassador David Kroodsma for a quick video interview (and a cheap and cheesy cyclists breakfast) before he headed off to Copenhagen. He reports that he arrived at the airport, put together his dad’s Bike Friday, hitched up the suitcase and rode on the dedicated path to the action. Bet Al Gore didn’t do that!